A recent post about Sir Hubert Parry's celebrated Blake setting Jerusalem generated considerable interest; so today I am venturing further down the Parry path. 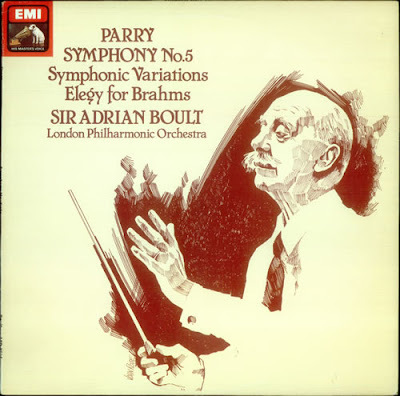 Sir Adrian Boult recorded Parry's Fifth Symphony (a work that should be much better known) in the autumn of 1978 for EMI. The session on 20th December in Studio One Abbey Road was both the last session for the Parry LP and the final session of Sir Adrian's distinguished recording career which had started in 1921. We knew that it would be the 89-year-old conductor's farewell to the studio, and I was privileged to be there for those last takes. The recordings of the three Parry works are still in the catalogue as part of the essential EMI/Warner Sir Adrian Boult: The Complete Conductor 10 CD box, and they completely belie their conductor's age. Yet just a few months before, Sir Adrian had written the following letter to his producer Christopher Bishop. I will be very surprised if our current generation of celebrity conductors are so self-effacing as they approach the end of their Indian Summer. I keep forgetting to tell you that I fear the 3-hour session will soon be a bit long for an 89-year-old. What is the solution? Would it be wise to engage someone who wants to make use of an hour or so at the end or beginning, or simply to pack up when we have had enough, or to start half an hour later, which would suit the players very much? I don't suppose you have ever had this problem before, and I know your company looks after the shekels rather carefully and will therefore wish to make a plan! Very sorry about it.